1Department of Energy Science, Alagappa University, Karaikudi – 630003, India. 2Bioenergy and Bioremediation Laboratory, Department of Microbiology, Alagappa University, Karaikudi – 630 003, Tamil Nadu, India. 3Department of Botany, DDE, Alagappa University, Karaikudi – 630 003, India. 4Department of Botany, Alagappa University, Karaikudi – 630 003, Tamil Nadu, India. 5Department of Microbiology, DDE, Alagappa University, Karaikudi – 630 003, Tamil Nadu, India. The present study aims to enhance the efficiency of anaerobic sludge microorganisms to produce hydrogen (H2) through various pre-treatment methods. The various pre-treatment methods such as base, acid, chloroform, heat shock, freezing and thawing have enabled to isolate acidogenic bacteria with higher bio H2 producing activity in an anoxic environment. From these various treatments, bacteria were isolated and screened for bio H2 capabilities. Among the one bacterial strain, AH4 strain showed maximum cumulative H2 production and Hydrogen Yield (HY) using 100% diary anaerobic sludge. AH4 strain was identified as Acinetobacter junii using 16S rRNA gene sequence and used for further experimental analysis. Biohydrogen productions of Acinetobacter junii were measured at different experimental setup such as various pH levels (5.0, 5.5, 6.0, 6.5, 7.0, 7.5 and 8.0) and different substrate concentration (10 – 100%) of dairy anaerobic sludge substrate. At pH 7.5 and 60% substrate concentration, the strain AH4 Acinetobacter junii displayed the maximum cumulative H2 production of 945.7 ml/L and H2 yield 1.35 mol H2/mol glucose. Based on our results, we concluded that Acinetobacter junii can be used as a promising bio agent for hydrogen production on a large scale using dairy anaerobic sludge as substrate. Keywords: Bio hydrogen, Dairy industry anaerobic sludge, Pretreatment, Optimization, Batch experiment. Hydrogen (H2) gas is the lightest element and highly combustible gas with faster diffusibility. H2 is greatly attributed as future fuel owing to its combustion energy of 120 MJ/kg and a heat capacity of 14.4 kJ/kg K 1. Being friendly, it is used in different chemical process industries especially in automobile industries to reduce pollution as its only product is water and does not discharge CO2 or any other deleterious pollutants, making H2 a justifiable replacement for the declining fossil fuels2,3. H2 is generated from both renewable and non-renewable sources, either by biological or physicochemical methods4. Karthic and Joseph (2012), a survey on 2008 reported that the total annual H2 fuel production was 368 trillion cubic meters which mostly from various industries such as chemical industry (40%), oil refineries (40%) and other huge variety of processes (20%) and, is growing exponentially (12% annually) at presently and will be contributing to a total energy market of 10% by 20255. H2 can also be produced by biological processes especially with aid of microorganisms providing a feasible means for the viable supply of H2 with low pollution and high efficiency6. Species of anaerobe such as Clostridium butyricum 7, Enterobacter asburiae 8, facultative anaerobe Escherichia coli9,aerobes Bacillus coagulans10 plays dominant role in fermentative H2 production. Microbial population from mixed anaerobic and other multiple sources (soil, sediment, compost, aerobic and anaerobic sludge) have been considered for significant H2 production by dark fermentation11. From an engineering point of view, production of H2 by mixed cultures is often preferred because it is economical and ease of control for the use of organic wastes as feedstock12. In another view as a microbiologist, the exploration to find the target specific strain with high activity of producing H2 is highly inevitable. Energy tapping from waste has gained more attraction in the past decade. H2 generation from domestic and industrial waste water pioneered with great interest on consideration of the environment as well as economy. Many effluents from various industries have been exploited for H2 energy recovery using microorganisms as prime source13. Dairy industries are one of the sectors which dispenses various dairy products (yogurt, cheese, butter, milk, ice cream etc.) ascribing as major source of wastewater generation. Dairy industry wastewater consists of 99% organic substances which are biodegradable14. The incomplete degradation of organic fraction in such sludge process cause foul odour and serious health effect to the environment, human, animals and insects15. Therefore, a cost-effective biological treatment process with efficient degradation potential is strongly recommended for management of huge quantum of dairy industry wastewater. Deploying microbes towards the treatment of wastewater to increase the productivity and to enhance the overall treatment efficiency is a better practice to minimize the energy spent over process. The increase growth of bacteria and their H2 evolving activity can be enhanced by pre-treatment of sludge in anaerobic condition16.Three main criteria of microbial H2 production include (i) the material selection with a bacterial population of interest; (ii) enrichment and (iii) acclimatize bacteria to specific substrates. Pre-treatment strategies for enhancing H2 producing microorganisms include heat-shock, load-shock, acid treatment, base treatment, aeration, freezing along with thawing, chloroform, and using iodopropane17–19. Several studies reported that pretreatment methods are highly responsible for the elevated H2-production on using targeted strains. To enhance the H2 generation the pretreatment of the anaerobic inoculum, and the hydrolysis reduces the impact of rate15,20. Therefore, a pre-treatment of seed sludge is necessary to repress H2 consuming bacteria and preserve the H2 producing bacteria from a mixed culture system. Reports suggested that currently heat shock pre-treatment method has been used successively and obtained highest H2 production rate (HPR)21,22. Thong et al, obtained a maximum H2 production yield of 1.96 mol H2/mol hexose with the application of load- shock treatment and resulted with a HPR of 11.2 mmol H2/ (L-h). Mu et al. (2007) reported heat-shock pre-treatment has produced high H2 production, among the three pre-treatment methods studied. The present investigation aims to isolates H2 producing bacteria from dairy industry anaerobic sludge by applying various pre-treatments that enable to enhanced production of H2. In addition, the effects of pH and substrate concentration were analyzed and optimized for the H2 production along with the treatment of dairy anaerobic sludge. The anaerobic sludge was collected in sterile decanters from the local dairy industry (Aavin) located in Madurai, Tamil Nadu, India. Aseptically collected sludge was transported immediately to the laboratory and stored at 4°C until further use. The important physico and chemical characteristics (pH, Conductivity, Salinity, volatile fatty acids (VFA), alkalinity, chemical oxygen demand (COD), total solids (TS), total suspended solid (TSS), volatile suspended solid (VSS) , Alkalinity of the dairy industry anaerobic sludge were analysed in accordance to APHA23. In addition, estimation of glucose concentration after experimentation was determined by DNS calorimetric method as glucose used as stranded 24. Total protein concentration was measured by Lowry method 25 with bovine serum albumin as standard. The collected anaerobic sludge was exposed to various pre-treatment methods namely heat shock, treatment with acid, base, chloroform, aeration, freezing and thawing. These pre-treatment methods were performed with procedures as described. According to Wang and Wan (2008) during heat shock treatment, the sludge was boiled at 100°C for 15 min and incubated at 37°C for 24 h 26. The acid pre-treatment was conducted by adjusting the pH at 3.0 of the sludge to by adding 1M HCl and incubated at 37°C for 24 h27. Similarly, the other treatments such as the base, aeration and chloroform pre-treatments were followed as Wang and Wan 26. In base pre-treatment, the pH of sludge was adjusted to 12 with 1M NaOH and incubated at 37°C for 24 h. The aeration treatment was carried out by aerating the sludge completely with air for 24 h. The chloroform pre-treatment was prepared by adding chloroform to the sludge at a concentration of 2% and incubated at 37°C for 24 h. Freezing and thawing pretreatment was conducted by freezing the sludge at -20°C for 24 h and afterward thawing it in a water shower at 37°C until it achieved room temperature28. The sludge without any pre-treatment was maintained as control for comparison. After the pretreatment, the pre-treated anaerobic sludge was used for isolation of bio H2 producing microorganisms. The bio H2 producing bacteria were isolated from the pre-treated dairy anaerobic sludge samples. The medium used for isolation and cultivation of strains grown on Thioglycolate Agar (TGA) medium and was prepared as follows; 15 g/L pancreatic digest of casein, 5.5 g/L dextrose, 5 g/L yeast extract, 2.5 g/L sodium chloride, 0.5 g/L sodium thioglycolate, 0.5 g/L L-cystine, 1 mg/L resazurin, 75 g/L agar with final pH 729. The medium was prepared and sterilized at 121°C for 15 min. successively, 100 µl of the pre-treated anaerobic sludge samples were plated individually on TGA agar plate and incubated overnight in an anaerobic jar at 37°C for 24 hrs. After that, the different colonies obtained in the plates were picked up individually and streaking was done on TGA plate. A single colony from well grown plate was taken and aseptically streaked over the fresh TGA agar plate to get pure culture for further study. The obtained pure culture of isolates were screened for production of H2 potential in batch fermentation. Working volume of 50 ml of 100% dairy sludge in 100ml Serum bottles were sterilised, after that 1ml of bacterial culture was inoculated for the evolution of H2 production capability. Each bottle was purged with pure nitrogen gas for 5 min to generate an anaerobic environment inside the bottle. Mouth of each serum bottles was sealed with a rubber stopper and crimped aluminium caps using manual crimper. The complete experimental setup was in shaking incubator for 48 h in 120 rpm at 37°C. After 48 h, the H2 gas production were confirmed by hungate technique using aseptic glass syringe30. Each experiment was repeated thrice. The composition of gas evolved was analysed using Gas chromatography (SHIMADZU GC-2014, Japan) was equipped with a thermal conductivity detector (TCD) and stainless-steel column packed with Porapak Q (80/100 mesh). The injection port, column oven and detector were operated at 100°C, 80°C and 150°C respectively. Nitrogen was used as the carrier gas at a flow rate of 20 ml/min29. The samples were injected using a 2 ml airtight gas syringe under the operating conditions mentioned above. Based on screening, the higher bio H2 production bacterial isolate was selected. The selected isolate was identified using 16S rRNA gene sequencing31 and a phylogenetic tree was constructed using MEGA5.0 Software. For microscopic observation, the bacteria culture was centrifuged at 8000rpm for 10min at 4°C. Then the pellet was resuspended with 0.8% saline solution. A loopful of cell suspension was placed on glass slide, heat fixed, washed with sterile disH2O and followed by gram staining method. After complete air drying, the slide were observed under the trinocular microscopic (LABOMED, Inc). In addition, the cell suspension were fixed on glass slide for overnight at 40°C with 2.5%, glutaraldehyde in phosphate buffer solution (PBS) at pH 7.4. After incubation, the slides were washed with PBS for three times and followed by dehydrated in series of ethanol (20%, 40%, 60%, 80%, & 100%) for 10 min interval and dried at room temperature in desiccator. 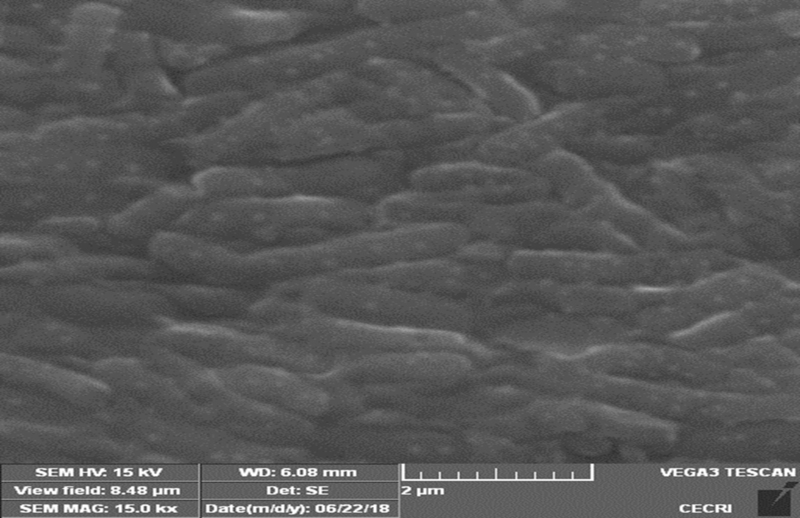 After coating with pt-pd using a sputter coating (TESCAN, VEGA3, and CZ) for 30min, the bacterial cells were observed under scanning electron microscope (SEM). The optimization study of bio H2 production (substrate concentration and pH) was carried out utilizing dairy anaerobic sludge with the selected bacterial strains. Serum bottles (100 ml) containing 10% to 100% concentration of dairy sludge at various pH (5.0, 5.5, 6.0, 6.5, 7.0, 7.5 and 8.0) were prepared and sterilized. Each bottle were aseptically inoculated and incubated as described earlier. After 48 h incubation in shaker, the gas volume and composition were analysed as mentioned before. The various physic chemical parameters (pH, Conductivity, Salinity, BOD, COD, VFA, TSS, TS, Glucose and Protein) were analysed as described earlier. All the experiments were done in triplicates. Where H (t): cumulative volume of H2 production (ml) at time t, l: the time of the lag phase (h), P: H2 production potential (ml), Rm: maximum H2 production rate (mL L-1 h-1), and e: exponential constant 2.71828. Cumulative H2 production (mL/L) was obtained by using Gompertz equation (Eq.1). Hydrogen Yield (HY) (mol H2 /mol glucose) was calculated as the total molar amount of H2 divided by molar amount of consumed glucose (as reducing sugar). The total molar amount of H2 (mol/l) was calculated using ideal gas law; total molar amount of H2 (mol/l) = Cumulative H2 production (L) divided by RT. Where, R = 0.0821 atm K-1 mol-1 and T=310 K.
The COD removal efficiency (CODR) was calculated using Eq. (2). where Ci represents the initial COD concentration (mg/L) and Cf denotes the final COD concentration (mg/L) in the batch experiment. The Physico-chemical characterization of the collected dairy industry anaerobic sludge was analysed and results were shown in Table 1. Dairy industry anaerobic sludge have rich source of organic matter substance. This useful form of energy could be converted into potential H2 energy source32. Table 1 show that the main component had many organic substances with low molecular weight, proteins, carbohydrates and Volatile Fatty Acids (VFA); which was consumed by microorganisms to convert bio H2. Table 1. Physicochemical Characteristics of the Dairy Industry anaerobic sludge. In the present investigation, the pre-treated dairy industry anaerobic sludge (Aavin) was used for isolation and identification of potential strain (i.e. bio H2 producing microorganisms). By heat shock treatment among the five isolates, two isolates only had the efficiency to produce biogas. In base treatment among three bacterial isolates one bacterium is responsible for biogas production. In chloroform treatment among the four bacterial isolates, one bacteria isolate was involved in biogas production. In other treatment methods such as acid treatment, aeration, freezing and thawing used, there was no biogas production evident by single bacteria out of five. As a result, only 4 out of 17 isolates were capable of producing H2 within 48 h and they were designated as AH2, AH4 (Aavin/Heat), AB2 (Aavin/Base) and AC3 (Aavin/Chloroform). However, the amount of bio H2 gas produced by each isolates were varied as shown in Table 2. The gas volume and gas composition were analysed. Among the four isolates, the isolate AH4 produced maximum amount of H2 gas production (560 mL/L) and cumulative hydrogen production (441.3 ml/L) respectivily utilizing dairy anaerobic sludge. As the AH4 isolate produced higher amount of H2 gas, it was selected for further studies. Table 2. Effect of various pre-treatment methods on biohydrogen production utilizing dairy industry anaerobic sludge. P – The hydrogen production potential, Rm – Maximum hydrogen production rate, H(t)– Cumulative H2 Production, HY – Hydrogen Yield. Results from the gas analysis showed that the biogas produced from the anaerobic fermentation contains only detectable bio H2 gas. The effect of different pre-treatment methods on the cumulative H2 production in batch tests (Table 2). The results indicated that the H2 production process stopped within 48 hrs for the entire test. No methane was observed in all the experiments. This was also reported by other scientists27,33. The progress of cumulative H2 production in the batch test was described as by the modified Gompertz model36. In this study, the results showed the cumulative H2 production obtained from each batch test was used to in the modified Gompertz model34 using software Origin 7.5 and the coefficient (R2) of all the regression was 0.943. Thus, the results from this study indicated that the modified Gompertz model could be used to describe the progress of cumulative H2 production in the batch tests. Bacteria such as Clostridium sp and Enterobacter sp could produce H2 during fermentation of glucose. However, spores of Clostridium sp (obligate bacteria) might survive in harsh environment but some homoacetogens (obligate anaerobic bacteria) failed to survive to anaerobic environment as O2 hindered to survive. Therefore, appropriate seed sludge pre-treatment is essential to conserve the activity of the H2-producing bacteria and suppress homoacetogens which ultimately increase the yield of H2 and maximum H2 production rate. This result proposed that all the pretreatment could successfully obtain H2 producing microorganisms, which can use glucose as a substrate. Among all the four pre-treatment techniques, heatshock pre-treatment was the best pre-treatment strategy. In the present study, the isolate AH4 showed maximal HY of 0.63 mol H2/mol glucose which was higher than other isolates (Table 2). The bacteria strain AH4 was identified by gene sequence of 16S rRNA. The partial sequence of the selected higher bio H2 producing bacteria (AH4) 16S rRNA gene was determined. The 16S rRNA gene sequence was aligned using the Blast program (http://www.ncbi.nlm. nih.gov.BLAST). The 16S rRNA gene sequence showed the 99% similarity with that of Acintobacter junii. Subsequently, a phylogenetic tree was constructed by MEGA 5.0 (Figure 1). 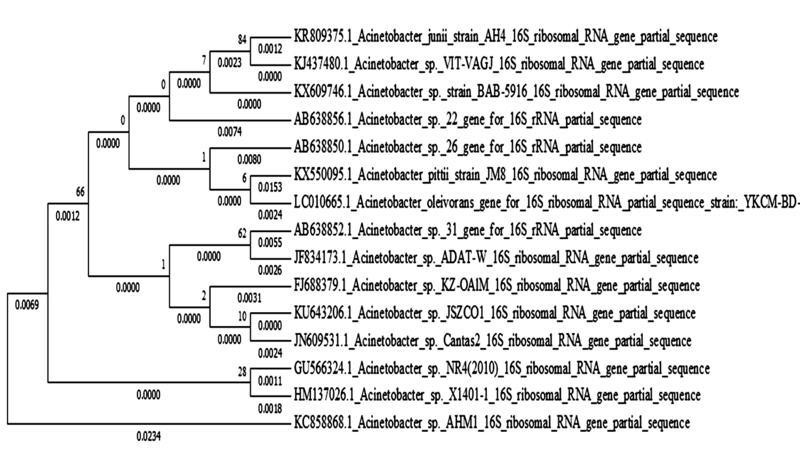 From the results of 16S rRNA, the strain AH4 belong to the species of Acintobacter junii and designated as Acintobacter junii AH4 (Accession number: KR809375). The gram staining method reveals the organism as gram positive the morphology of AH4 strain obtained from SEM image is shown (Figure 2). Fermentative H2 production is influenced by two factors (pH and substrate concentration). Optimization of bio H2 production with substrate (industry anaerobic sludge) of different concentration (10 to 100%) and pH (5 to 8) by Acintobacter junii cultures is shown in (Table 3). At pH 7.5, the maximum amount of cumulative H2 production (945.7 ml/L) and maximum HY (1.35 mol H2/mol glucose) was observed 60% substrate concentration under mesophilic condition at a COD removal effiviency of the isolates is 58.38%. It was reported that the pH range 7.5 was found to be the highest H2 production condition35.The results of other reports are compared with our results as shown in (Table 4). Therefore, Acintobacter junii AH4 is a potential bacterial strain that can be used for efficient H2 production utilizing anaerobic sludge in the large scale under mesophilic condition. Table 3. Hydrogen production during optimization studies by Acintobacter junii (AH4). H(t) – Cumulative H2 Production; HY – Hydrogen Yield * % of H2 calculated based on GC analysis. *% of H2 concentration calculated based on Gas chromatography. Table 4. Comparison of fermentative hydrogen production. The present study concluded that the efficient H2 producing bacteria can be enriched by heat shock pre-treatment method directly from the anaerobic sludge of the dairy industry. It was found to be the most effective method for enriching H2-producing bacteria and suppressing H2 consuming bacteria. Here, we isolated Acinetobacter junii AH4 after heat shock-treatement which exhibited highest cumulative H2 production and HY. Similarly, the optimum pH was found to be at 7.5 with 60% substrate concentration for higher bio H2 production. Finally, Acinetobacter junii can be used for large scale H2 production utilizing dairy waste water. Department of Science and Technology-Science and Engineering Research Board (DST-SERB-No.SB/YS/LS-47/2013), India. Department of Science and Technology – Promotion of University Research and Scientific Excellence (DST-PURSE) (Order No. SR/PURSE phase 2/38(G), dated; 21.02.2017), India. University Science Instrumentation Centre (USIC), Alagappa University, Karaikudi, Tamil Nadu, India. 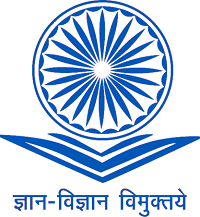 Department of Higher Education Ministry of Human Resource Development (MHRD), Government of India, Rashtriya Uchchatar Shiksha Abhiyan – 2 (RUSA-2). The authors declares that there is no conflict of interest. Gupta, R.B. Hydrogen fuel: Production, Transport, and Storage. 2008. Tao, Y., Chen, Y., Wu, Y., He, Y., & Zhou, Z. High hydrogen yield from a two-step process of dark- and photo-fermentation of sucrose. International Journal of Hydrogen Energy, 2007; 32:200–206. Jain, I.P. Hydrogen the fuel for 21st century. International Journal of Hydrogen Energy, 2009; 34:7368–7378. Rupprecht, J. From systems biology to fuel-Chlamydomonas reinhardtii as a model for a systems biology approach to improve biohydrogen production. Journal of Biotechnology, 2009; 142:10–20. Karthic, P., & Joseph, S. Comparison and limitations of biohydrogen production processes. Research Journal of Biotechnology, 2012; 7:59–71. Xia, A., Jacob, A., Herrmann, C., & Murphy, J.D. Fermentative bio-hydrogen production from galactose. Energy, 2016; 96:346–354. Wang, X., Jin, B., & Mulcahy, D. Impact of carbon and nitrogen sources on hydrogen production by a newly isolated Clostridium butyricum W5. International Journal of Hydrogen Energy, 2008; 33:4998–5005. Shin, J.H., Hyun Yoon, J., Eun Kyoung Ahn, Kim, M.S., Jun Sim, S, & Park, T.H. Fermentative hydrogen production by the newly isolated Enterobacter asburiae SNU-1. International Journal of Hydrogen Energy, 2007; 32:192–199. Maeda, T., & Wood, T.K. Formate detection by potassium permanganate for enhanced hydrogen production in Escherichia coli. International Journal of Hydrogen Energy, 2008; 33:2409–2412. 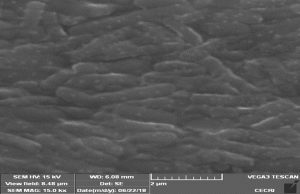 Kotay, S.M, & Das, D. Microbial hydrogen production with Bacillus coagulans IIT-BT S1 isolated from anaerobic sewage sludge. Bioresource Technology, 2007; 98:1183–90. Davila-Vazquez, G., Alatriste-Mondragón , F., de León-Rodríguez. A., & Razo-Flores, E. Fermentative hydrogen production in batch experiments using lactose, cheese whey and glucose: Influence of initial substrate concentration and pH. International Journal of Hydrogen Energy, 2008; 33:4989–97. Wang, Y., Li, R., Li, W., Fan, Y., & Hou, H. Effects of pretreatment of natural bacterial source and raw material on fermentative biohydrogen production. International Journal of Hydrogen Energy, 2011; 86:2–7. Ruggeri, B., Tommasi, T., & Sassi, G. Experimental kinetics and dynamics of hydrogen production on glucose by hydrogen forming bacteria (HFB) culture. International Journal of Hydrogen Energy, 2009; 34:753–763. Naidoo, S, & Olaniran, A.O. Treated wastewater effluent as a source of microbial pollution of surface water resources. International Journal of Environmental Research and Public Health 2014; 11:249–270. Rivas, J., Prazeres, A.R., & Carvalho, F. Aerobic biodegradation of precoagulated cheese whey wastewater. Journal of Agricultural and Food Chemistry 2011; 59:2511–2517. Zhu, H., & Béland, M. Evaluation of alternative methods of preparing hydrogen producing seeds from digested wastewater sludge. International Journal of Hydrogen Energy, 2006; 31:1980–1988. Venkata Mohan, S., Lalit Babu, V., & Sarma, P.N. 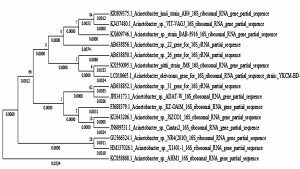 Anaerobic biohydrogen production from dairy wastewater treatment in sequencing batch reactor (AnSBR): Effect of organic loading rate. Enzyme and Microbial Technology, 2007; 41:506–15. Hawkes, F.R., Dinsdale, R., Hawkes, D.L., & Hussy, I. Sustainable fermentative hydrogen production: Challenges for process optimisation. International Journal of Hydrogen Energy, 2002; 27:1339–1347. Venkata Mohan, S., Lalit Babu, V., Sarma, P.N. Effect of various pretreatment methods on anaerobic mixed microflora to enhance biohydrogen production utilizing dairy wastewater as substrate. Bioresource Technology, 2008; 99:59–67. Kim, J., Park, C., Kim, T-H., Lee, M., Kim, S., & Kim, S-W. Effects of Various Pretreatments for Enhanced Anaerobic Digestion with Waste Activated Sludge. Journal of Bioscience and Bioengineering, 2003; 95:271–275. O-Thong, S., Prasertsan, P., & Birkeland, N.K. Evaluation of methods for preparing hydrogen-producing seed inocula under thermophilic condition by process performance and microbial community analysis. Bioresource Technology, 2009; 100:909–918. Mu, Y., Yu, H-Q., & Wang, G. Evaluation of three methods for enriching H2-producing cultures from anaerobic sludge. Enzyme and Microbial Technology, 2007; 40:947–953. APHA. Standard Methods for the Examination of Water and Wastewater. 1995. Miller, G.L. Use of Dinitrosalicylic Acid Reagent for Determination of Reducing Sugar. Analytical Chemistry, 1959; 31:426–428. Randall, R.J, Lewis, A. The folin by oliver. Readings, 1951; 193:265–275. Wang, J., & Wan, W. Comparison of different pretreatment methods for enriching hydrogen-producing bacteria from digested sludge. International Journal of Hydrogen Energy, 2008; 33:2934–2941. Chen, C.C., Lin, C.Y., Lin, M.C. Acid-base enrichment enhances anaerobic hydrogen production process. Applied Microbiology and Biotechnology, 2002; 58:224–228. Cheong, D-Y., & Hansen, C.L. Bacterial stress enrichment enhances anaerobic hydrogen production in cattle manure sludge. Applied Microbiology and Biotechnology, 2006; 72:635–643. Dinesh, G.H., Sundaram, K., Mohanrasu, K., Murugan, R.S., Vinayaga, P.V., Swetha, T.R.A., Selvakumar, G & Arun, A. Optimization ( Substrate and pH ) and Anaerobic Fermentative Hydrogen Production by Various Industrial Wastes Isolates Utilizing Biscuit Industry Waste as Substrate. Journal of Pure and Applied Microbiology, 2018; 12.(3):1587-1595. Miller T.L, Wolin M J. A serum bottle modification of the Hungate technique for cultivating obligate anaerobes. Applied Microbiology 1974; 27:985–7. Srivastava, S., Kumar, A., Pandey, A., & Pandey, A. Intensification of hydrogen production by B. licheniformis using kitchen waste as substrate. International Journal of Hydrogen Energy, 2017; 42:21659–21666. Weemaes, M.P.J., Verstraete, W.H. Evaluation of current wet sludge disintegration techniques. Journal of Chemical Technology and Biotechnology, 1998; 73:83–92. Hu, B., & Chen, S. Pretreatment of methanogenic granules for immobilized hydrogen fermentation. International Journal of Hydrogen Energy, 2007; 32:3266–3273. Lay, J-J., Lee, Y-J., & Noike, T. Feasibility of biological hydrogen production from organic fraction of municipal solid waste. Water Research, 1999; 33:2579–2586. Fang, H.H.P., & Liu, H. Effect of pH on hydrogen production from glucose by a mixed culture. Bioresource Technology, 2002; 82:87–93. Abdul, P.M., Jahim, J., Harun, S., Markom, M., Hassan, O., & Mohammad, A.W. Biohydrogen production from pentose-rich oil palm empty fruit bunch molasses: A first trial. International Journal of Hydrogen Energy, 2013; 38:15693–15699. Dan Jiang, Fang, Z., Chin, S., Tian, X., & Su, T. Biohydrogen Production from Hydrolysates of Selected Tropical Biomass Wastes with Clostridium Butyricum. Scientific Reports, 2016; 6:27205. Khamtib, S., Plangklang, P., Reungsang, A. Optimization of fermentative hydrogen production from hydrolysate of microwave assisted sulfuric acid pretreated oil palm trunk by hot spring enriched culture. International Journal of Hydrogen Energy, 2011; 36: 14204–14216. Pattra, S., Sangyoka, S., Boonmee, M., & Reungsang, A. Bio-hydrogen production from the fermentation of sugarcane bagasse hydrolysate by Clostridium butyricum. International Journal of Hydrogen Energy, 2008; 33:5256–5265. Chang, A.C.C., Tu, Y.H., Huang, M.H., Lay, CH., & Lin, C.Y. Hydrogen production by the anaerobic fermentation from acid hydrolyzed rice straw hydrolysate. International Journal of Hydrogen Energy, 2011; 36: 14280–14288. © The Author(s) 2018. Open Access. This article is distributed under the terms of the Creative Commons Attribution 4.0 International License which permits unrestricted use, sharing, distribution, and reproduction in any medium, provided you give appropriate credit to the original author(s) and the source, provide a link to the Creative Commons license, and indicate if changes were made.